"What is the measure of John Mills’s success? If you were to measure him quantitatively then his three discs in fourteen years is an utter failure. However, if the measuring stick is quality despite his once in a blue moon showing, then he is an outright genius by taking the time and tenacity over his trade. That said, the slightly adorned “sequel” is an utter triumph that will leave you quietly howling at the moon." "It takes more than technical mastery to compose music and play it on guitar in a way that really touches people's hearts. Australian, John Mills, has just such artistic talent. He uses even the silence between notes to shape his tender, lyrical melodies. Rather than blister the ears with cascades of notes, Mills has the courage to place each note like a precious star allowing the emotion of the melody to carry through. That Mills also happens to be among the top 10 best guitar players that I've ever heard makes Hallowed Moon just that much more special." "This melodically beautiful album features arrangments for violin, viola, cello, oboe, chime harp, rain maker, concert bass drum, tubular bells and nature sounds while showcasing Mills' splendid guitar-work recorded in live settings. The understated collection of simple beauty and graceful performance will transport the listener to a gentle place filled with stirring melodies." "This is one of the most unusual instrumental guitar albums I've ever had the pleasure of reviewing. Mills is a self-taught musician which in part accounts for his unique style of composition, arranging and playing. The notes are separate, soft and clear - almost harp-like in resonance. Yet unlike some who lack formal training, his technical skill and approach to his instrument have no obvious deficiencies. A music box like sweetness charms the listener, but most importantly one understands that the artist is directly communicating the song of his heart through his instrument. Though surrounded by other sounds from violin, viola, cello, oboe and rain maker, the guitar shines through like the star of Bethlehem in a bejewelled heaven. Excellent for stress reduction, sure sales with in-store play." "For the first time, this Australian composer is releasing a CD here in America. Upon hearing it during a stressful time in my life, my only thought was, "Why didn't you do it sooner?". Mills' quiet, contemplative guitar music reflects a peaceful night on the beach, under a luminous moon. He also demonstrates his skill in such songs as his rendition of, Away In A Manger, where he makes an ordinary guitar sound like a harpsicord. I only hope Mills gives us the privilege of hearing more of his music in the future." 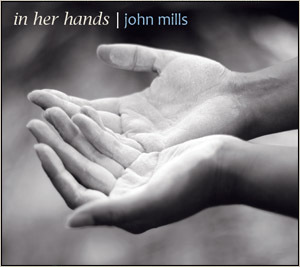 "The acoustic guitar compositions by John Mills on this new CD are relaxed, melodic and nurtured into full bloom by his gentle touch. His touch on the fingerboard brings sweet and subtle tunes forth, at times using his dexterity to reach with both hands to bring out just the right sequence, nudging, rather than slamming his strings to create wondrous results. His pacing is like a walk outdoors under a moonlit sky with the quiet spaces between notes allowing the mind to wander and reflect, neither driven nor hurried, simply listening and appreciating. When he is joined by oboe, cello, viola, chimes and percussion, they accentuate and flesh out his visions. These contemporary acoustic compositions possess a mature feel where each one plays a part in weaving a whole texture that wraps itself around the listener like a comfortable blanket or an old sweater on a chilly night. It's just enough to take the egde off, but not enough to dull the senses."